Aoibheanns Pink Tie. One fathers positive response to the loss of his child. – My thoughts on a page. Aoibheanns Pink Tie. One fathers positive response to the loss of his child. “You have cancer”. Can you imagine sitting in a surgery and hearing that? Now imagine sitting there with your husband or partner and hearing “Your son/daughter has cancer”. Imagine the next scene, if your child is old enough, you must sit there and support your son or daughter, as they hear for the very first time that they have cancer. I have looked on in the past year and watched as a bystander, close friends live this nightmare. After being told the news their then twelve year old boy had leukemia, shell shocked and raw, they were referred to Crumlin Hospital within twenty four hours. Here in Ireland every week, there are families reeling, as they take their child by the hand, or hold them close, and enter Crumlin hospital. They walk together, that most dreaded of walks, to St Johns Ward, Oncology. Every step takes them nearer a world they cannot even imagine, and further from the life they had taken for granted. Once they enter this new world, even if they have a successful outcome, life can never be the same again. We, who look on from afar, may at times ponder how hard it must be. However we can never really know. We can never imagine how many painful decisions and difficult days those families face. “I can barely look at him today. He is so smiley. And when he smiles up at me I hate the fact that I am going to take him to a hospital and hand him over to a surgeon to have his lower leg amputated. I want to tell him not to smile at me. That I am the last person he should be smiling at”. On reading this I wondered how you can survive as parents such a nightmare. 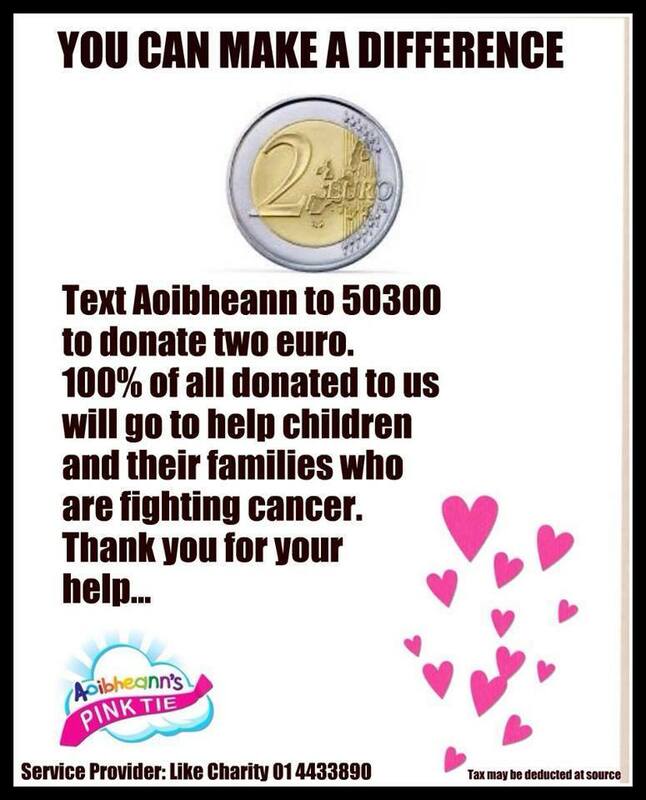 It is at this point I want to speak of the purpose of this post, the promotion in Ireland of the amazing work of Aoibheanns pink tie, and to those who read who are not living here, I know there must be similar charities where you live. I asked the question “how do parents survive?”, and in doing so I remember hearing a consultant saying “There are three reactions to a childs diagnosis of cancer. A small minority struggle to come to terms with it ever. Others either embrace life like never before, or fundraise”. 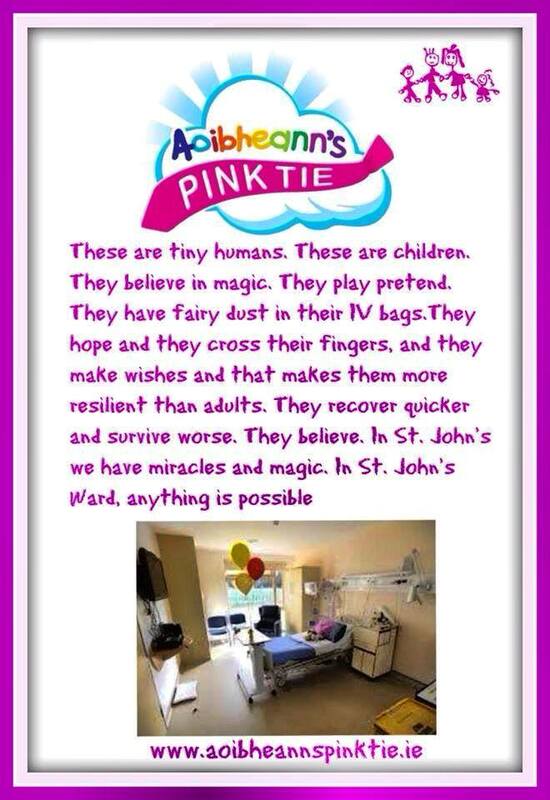 I first met the beautiful inspiration for Aoibheanns Pink Tie, at her removal. She was just eight years old and so very pretty. I had become friendly with her aunt, Caitriona. As I came to pay my respects, I recall her mother glued to her coffin, and her father’s gratitude that I called by. I also recall the child friendly atmosphere and the giant bouncy castle in the garden, which was ordered to amuse the many children who would call. I remember thinking “These are exceptional people”. How right I was. Not too long after losing Aoibheann her grieving father burst into action. He remembered so well the hardships of daily life when you have a child with cancer. The time spent in hospital, time away from work, petrol money, appointments, and accommodation for the other children in the family. So he began to fundraise. He wanted to be able to offer practical help to families who were living this nightmare. Maybe petrol money, or help with a mortgage. Maybe a family trip away? There were endless possibilities. One of my favourite things they have done is fundraise to buy dry suits for the children on St Johns who have hickman lines. A hickman line (freddy) is a tube through which they get their chemo. It limits the amount of needles they need but it means no swimming. For a child facing more than two years of treatment, that is a huge blow. I remember when Dan heard that it was a major blow. He and his family could not imagine a summer in which you could not swim. By giving these children dry suits, you do not make them better, but you do make them “normal”. Dan would have loved a dry suit. So to all of you Irish bloggers I just wanted to give a big shout out to Aoibheanns pink tie. It is a permanent reminder of a beautiful little girl, but it is also a whole lot more. Now that you have heard about this amazing charity, if ever you see them collecting or hear about them you might consider giving them a few euro. They really do an amazing job. To all of you who read this you might also consider “liking” them on facebook, they’re looking to make it to 14,000 this weekend. To all who give their time to APT I salute you. Dan never got the chance to make use of what you do, but I know many are so very grateful to you. And to Jimmy Norman. I have no doubt your little princess is immensely proud of you. Your loss is unimaginable but you are really making a difference, and I and so many others just want to say “Thank You for doing all you do”. **** If you wish to read any posts on Dans journey click on the bone marrow link at the top of the page. I don’t have any euros, but I do have a sister with a rare bladder cancer and very little hope. My insides writhe every single day at the idea of losing my sister, and I’ve looked at my children and asked that awful question… What if it were one of them? as everyone everywhere else in the world knows, we have crappy, crappy, health insurance in the states. When something horrible happens, we turn to each other and to places like St. Judes, a hospital for children who have cancer, and parents with no means to pay for treatment. For my sister, we did a kickstarter campaign. she’s been trying to raise 75,000 dollars– don’t ask me what that is in euros. I wish good luck to APT, and pray for a cure. I am so sorry to hear about your sister. That is a whopping amount of money to have to raise. What a terrible pressure as well as being ill. I hope she is comfortable. Thank goodness for the kindness of people. This father really is one in a million. Before I “liked” Tric I made my donation – what an inspiring piece of writing – I am away now to share this with as many as possible. Thanks so much Chris. This is an amazing charity. Every penny really makes a difference. They will be delighted with your efforts. A very timely post for me, Tric. I have two friends who lost a daughter to leukemia almost two years ago. She would have turned nine this week. My friends, too, nearly went into bankruptcy dealing with all of her treatments and the loss of work, etc. All of our friends raised what funds we could for them. As if that could ever help. I applaud your efforts, even as I wonder about a world where medical care is done for profit. We are so lucky in this country as we do not have to deal with bills like that, but as you know the treatment for some children means that parents have to leave work, and have other financial hardships. Your poor friends, have they still bills to pay? They will no doubt have bills to pay for the rest of their lives. And they will mourn their little one every time they write a check. That is horrendous. In memory of Dan his friends and family have already raised over €30,000 since we lost him in November. The money has gone to the home nursing team, the hospital, and the Ronald Mc Donald house. The founder of Aoibheanns Pink Tie though has taken his loss a step farther. He is amazing. St. Jude was my father’s favorite saint. When my father passed away I made monthly donations to them in his memory. I think it a horribly cruel world that a parent suffers the illness, and possibly loss, of their child. AND have to worry about paying for it. Good luck with your fundraising efforts there. And blessings to all of the families who must suffer this horrible pain. Thank you. I don’t know how they get through. All we can do really is support them in any way we can. Isn’t it strange the things we do in memory of our loved ones. This father has set up Aoibheanns pink tie, and you favoured donations to St Jude. By the way Aoibheann is an Irish name meaning “beautiful”. I thought you’d want to know if you didn’t already. I didn’t know that Tric, thank you. Can you ‘show me’ how it’s pronounced? I would love to start saying it to my children and grands. I’ve seen some amazing things done in the name of love and memory. eve een. You would describe something that is beautiful by saying most commonly “go h’álainn” or less commonly “go h’aoibheann”,meaning adorable. I think it’s a beautiful name for a girl. Another beauty for a girl is Alannah, which means “wee darling”, or “pet”. Thank you Tric! I will practice those! I love both of those names. this is beautiful and kind and so thoughtful. what a gesture and no better cause. Thanks Beth. Jimmy leaves me thinking how amazing some people are. They really make a big difference as opposed to the small differences the majority of us make. What a wonderful cause, donation made. Oh thank you. I really posted this to draw attention to this amazing charity and to highlight the incredible work they do. As Ronald Reagan said, “We can’t help everybody, but everybody can help somebody”. Well done for putting energy and conviction into helping those who are in the same situation. This charity is incredible, fronted by a man who is so soon into his own grief. It leaves me breathless in a way. One person with effort can make an enormous difference to peoples lives. I cannot imagine being told that my son had cancer, nor imagine how I would respond to such news. Having gone through the agony of losing my step father so suddenly, I can’t even fathom how it would feel to lose a child. It is great that you are sharing this. Thank you. Thank you. After watching from the sidelines my friend going through the roller coaster of chemo, bone marrow transplant and viruses, I can only admire what Aoibheanns Dad has achieved in such a short time. Thanks so much April. My main aim was to highlight the charity as many have not heard about it, and also to say a big “thank you” to Jimmy, Aoibheanns dad. What an amazing job he does. I could relate to all that you said. My son passed away from AML leukemia. The devastation of seeing your child suffer the way he did. 6 days away from finishing his 6 months of chemotherapy, he went into septic shock. We didn’t know if he would wake up losing his hands and legs. How would I tell my strapping, athletic, handsome son that was a swimmer and musician that he no longer had hands or legs. Instead he never woke up. I don’t know which is more tragic. Thank you for bringing more awareness to such an important cause. The name of our foundation we started in his name is The Luck2Tuck Foundation. Oh your comment brings back such sad memories of a time his mom and dad sat waiting hoping he would come off the ventilator and thinking they would never again hear his voice. Then amazingly he did wake up and get off it so they got to speak with him again. However it was not to last. In the end they got all they could have wished for in that he got to come home for two short but lovely days, and finish lifes journey in the company of all who loved him. Thank you so much for making contact. I will check out your foundation in memory of your fine, strong boy. Pingback: A mother in a million. | My thoughts on a page.